Ceramic owl dispenser will dispense liquid such as soy sauce or milk. The top is removable for easy refilling. Picture shows sauce dispensers/creamers from front: blue/grey & white, second row left to right brown & white, snow/white & blue, rear left to right Kizeto/beige & white, midnight/black & white, and grey/sky blue & white. 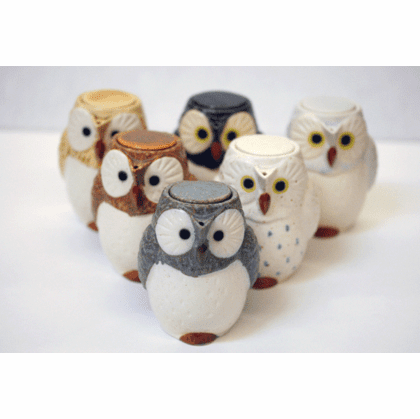 Matching owl toothpick holders/creamers available.